The Final Round is made of up 8 teams in A-division & 8 teams in B-division. 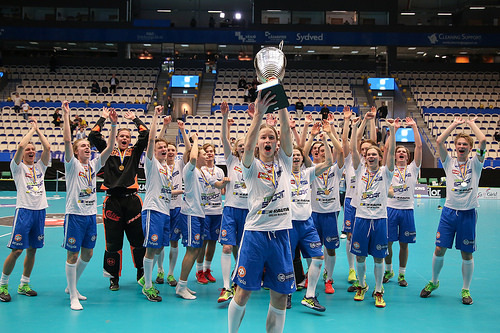 All A-division teams, as well as two B-division teams were directly qualified, based on results from the Men´s U19 WFC 2015. The remaining 6 spots in B-division were determined via regional quota systems and qualification events. * Poland are relegated to B-division for U19 WFC 2019. 06.05. 13:00 A-Semi 1: FIN MU19 - SUI MU19 7-6 ot. 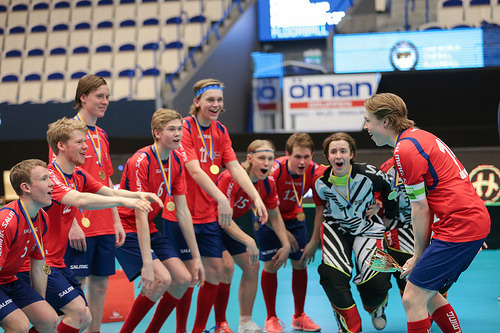 * Norway are promoted to A-division for U19 WFC 2019. A-Division: Every team plays each other once within their group. The top two teams after the group stage proceed to the semi-finals, while the other four teams have placement matches. The 8th placed team in A-division will be relegated to B-division for 2019. B-Division: Every team plays each other once within their group. The top two teams after the group stage proceed to the semi-finals, while the other four teams have placement matches. The winner of B-division will be promoted to A-division for 2019. A total of 26 teams registered for the 9th Men´s U19 World Floorball Championships. In the qualification events, France & Iran competed for the first time in this category. Qualification events were held in Europe (Italy) and Asia-Oceania (Japan) in September 2016. General information on those events can be found below. The European qualification event was held in Celano, Italy, from 6th - 10th September 2016. Based on the results of the event, and the IFF regional quota system, two teams - Hungary & Estonia - qualified from Europe. The Asia-Oceania qualification event was held in Fuji-Yoshida, Japan from 18th - 20th September 2016. Based on the results of the event, and the IFF regional quota system, two teams - Australia & Japan - qualified from Asia-Oceania. Based on the IFF regional quota system, two teams - Canada & USA - qualified from the Americas.